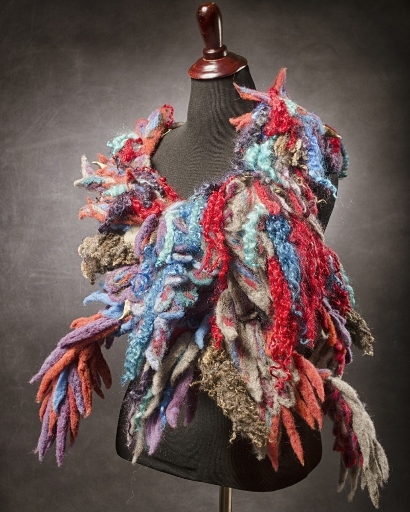 Rachele used roving wool, dyed sheep and mohair locks to create the needle felted bra, as well as oven baked and painted clay in the wings and beaks and two plastic eyes in the face that were salvaged from a stuffed animal. Her intricately created piece exudes new life and movement, and is sure to make its model channel her inner beast! 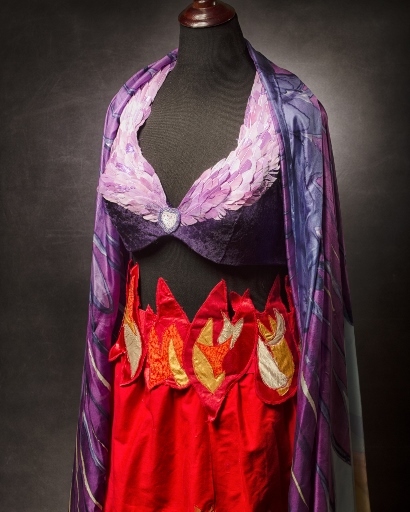 Lorraine used hand-dyed feathers, appliquéd fabrics and hand painted silk to create her bra and accompanying skirt of flames and silk veil. More of Lorraine’s work can be seen in her Etsy shop.